I’d like to take a quick time-out to give you my theory on races. I truly dislike really competitive races and would much rather be with a group of people whose goal is that everyone finishes and has a good time doing just that. Let the really good elite athletes take off first. They are amazing but we are not one of them (I’m presuming a lot about you right now aren’t I?). I’m also not part of the next wave. Those who aren’t elite but either were in their high school days (long gone by) or just have competition running through their veins. I think this wave of athletes is the harshest. These are the kill counters. I find counting your “kills” disgusting and unsportsmanlike. Counting your kills is when you are running (or whatever-ing) and you count up each person you pass. Now if you have to do this in your head to motivate yourself, be my guest. Making a contest out of it and proudly proclaiming your kill number … well … it makes you a douche. There I said it. I feel so much better when I run by someone who has started walking and encouraged them to keep going. It’s an anti-kill. That’s the next wave, the middle of the packers, the anti-killers. One of my favorite races has always been the Danskin Triathlon (http://www.danskintriathlon.net/). Given that it is an all female race the stress is already cut back on (sorry dudes but you are a giant ball of testrosterone competitive stress). Add the fact that all participants are encouraged to help cheer on fellow competitors and you have a chorus of “you go girl” pushing you to the finish line! Ladies if you have ever wanted to do a triathlon do this one. It’s a wonderful and supportive atmosphere and I bet money that you can finish and finish happy (or at least not dead). The Color Run calls itself the “Happiest 5K on the Planet.” Woooooooohhhh … hold on there Color Run … that’s a mighty big proclamation you are trying to sell there. You sure you can make good on that promise? I mean I’ve done some 5Ks where people were pretty happy. Dee Dee and I would just have to find out for ourselves. I was giddy with anticipation the day before as I picked up our race packets and was anxious to get to the action. When Dee Dee showed up to my house Saturday afternoon we both eagerly agreed that we were going ballz out on this thing. Get mega colored or go home was our motto. 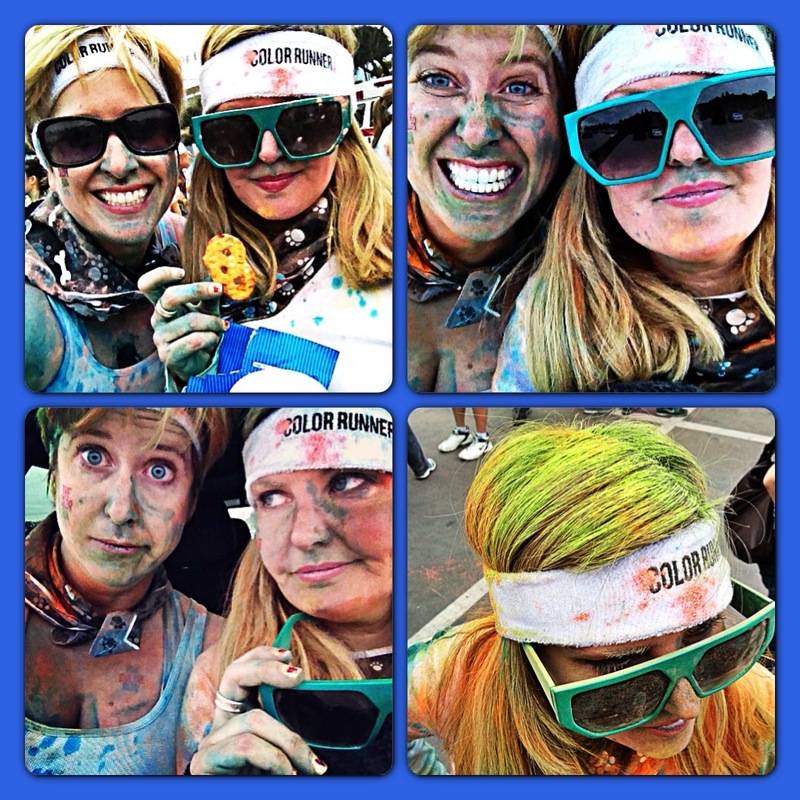 There is something freeing about doing a non-timed 5K that consists of you running, walking, skipping and dancing around the Dodger’s stadium parking lot while volunteers happily throw colored powder at you. Using our sunglasses as a shield we would gleefully run up to anyone with color demanding to be hit with it while twirling around like lunatics. Total blast! Dee Dee was nice enough to alert me when my teeth were an unnatural un-white color. Apparently I smiled a lot while getting doused. At the end of the “race” (it’s a race in so much as there is a start and finish line) we headed down to the party pit where every ten minutes or so everyone in the audience threw color up in the air all at once. After coughing our way through a cloud of happiness we headed off to our own end of the race party … at a local bar. You’d be amazed how easily you forget you are covered head to toe in color until someone asks you about it. Between a beer and delicious caramel and bacon covered popcorn (oh yah — you heard that right) I’d look over at Dee Dee and think, “I totally forgot we look like weirdos right now.” Weird and happy! Just the way I like it! 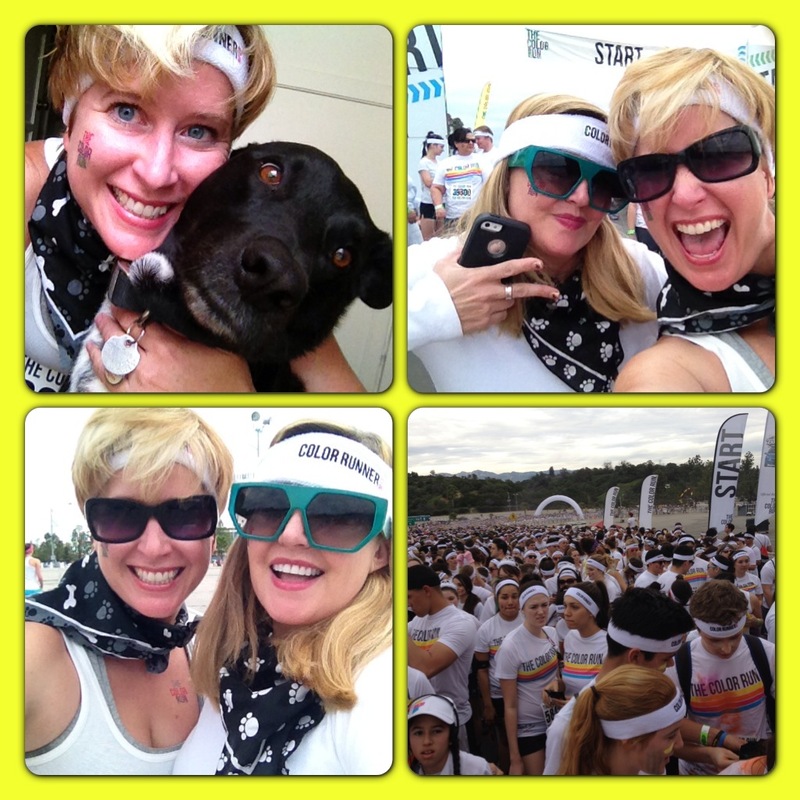 I dare say the color run is … The Happiest 5K on the Planet! Yay! I knew you’d have a good time. I want to run with you next year… okay walk! But I really want to do it! u look awesome! but u aint seen nothing babe – come to india in march (i know u’re going to say – no never! but still!) we have a festival called holi http://en.wikipedia.org/wiki/Holi – thats what its all about. u throw color at everyone – and water – and stuff – theres no racing – not even walking (so folks like me dont hv to pretend) and then u have alcohol / intoxicants – some stuff called bhang http://en.wikipedia.org/wiki/Bhang – sounds worse than it tastes actually – (or beer if thats yr poison!) Try it sometime! Sangita – It did make me think of Holi although I didn’t know the name so kept calling it the “color holiday in India.” I had to Google pictures so I could show people. It sounds like fun. 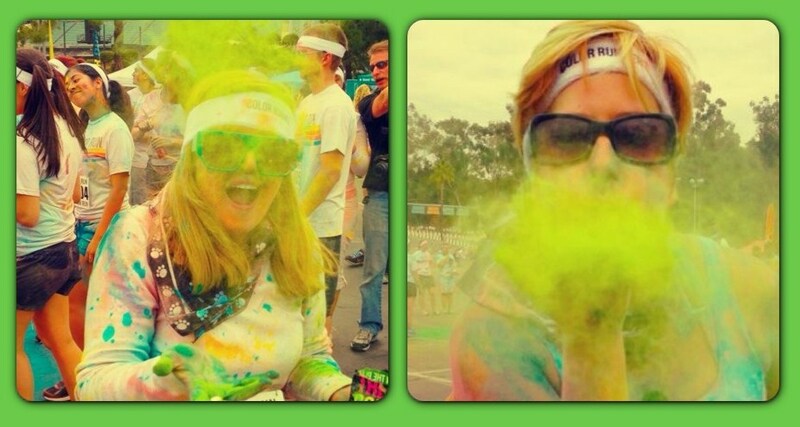 The Color Run was definately missing some bhang (or beer)! The wiki page you linked for Holi mentions a couple different 5K color runs under the “Influence on other Cultures” section. I told Priya that she and Vrinda should do the Color Run when it comes to the east coast. This was by far my favorite run, cough, walk, run! You were a blast as always, and I can’t wait to do it again! I love The Color Run!!! Thank you Wendy for thinking of me ;), you’re the best. So is Villains Tavern.